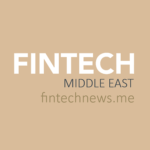 E-commerce is set for strong growth in the Middle East and North Africa (MENA) region. The market was worth US$8.3 billion in 2017 and is expected to more than triple by 2022 to reach US$28.5 billion, according to a new research by Bain & Company and Google. 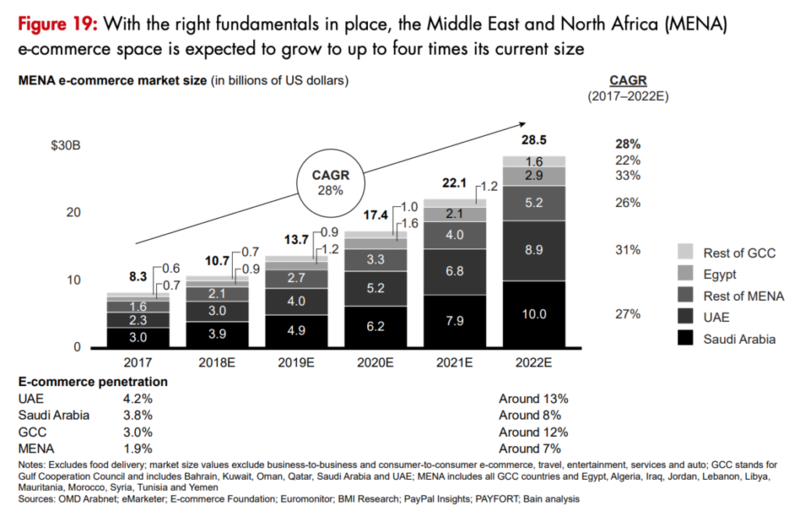 According to the E-commerce in MENA: Opportunity Beyond the Hype report, released in February, e-commerce in the region is rising at an annual growth rate of 25%, ahead of the global average. 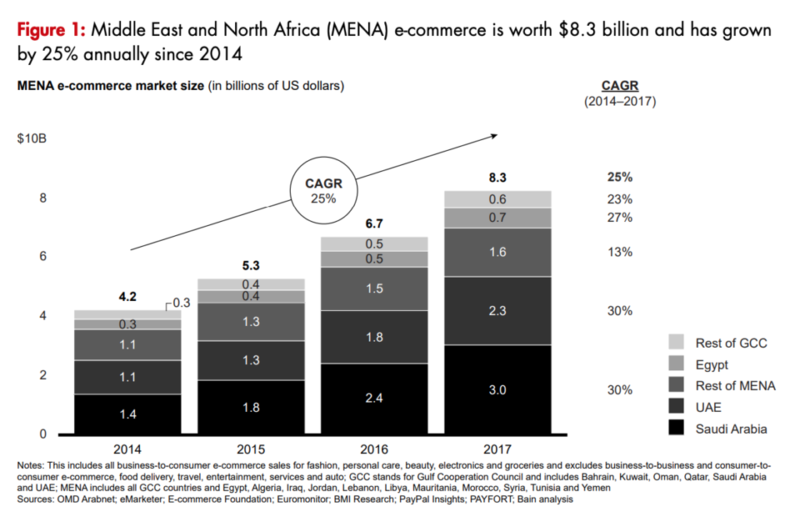 The Gulf Cooperation Council (GCC) and Egypt account for 80% of the e-commerce market, and they have been growing at a 30% annual rate, more than twice as fast as the rest of MENA. The United Arab Emirates (UAE) is currently the most advanced e-commerce market in the region with a penetration rate of 4.2%, followed by the Kingdom of Saudi Arabia (KSA) at 3.8%. Mass Internet adoption in MENA, especially in the GCC, took off around the mid-2000s, mostly driven by smartphones and social media and underpinned by faster Internet speeds. 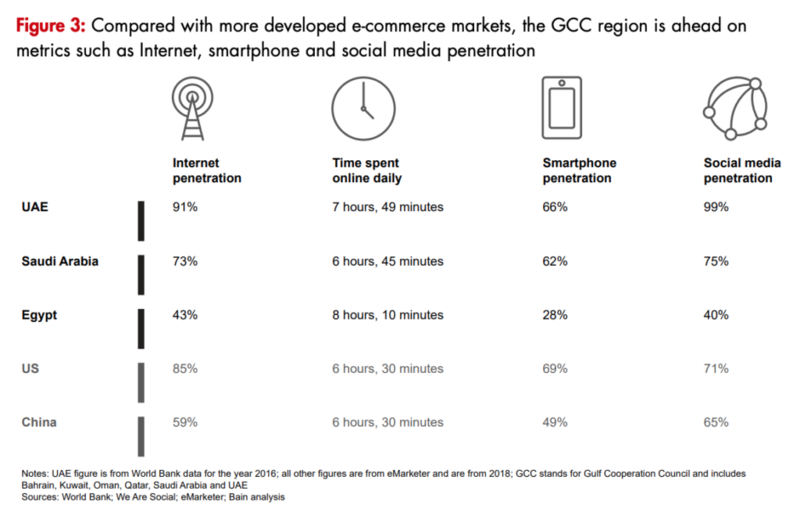 Today, GCC nations stand ahead of more developed e-commerce markets including the US and China in terms of Internet and smartphone usage. According to Statista, Internet penetration in the Middle East stood at 64.5% in 2018, above the global average of 54.5%. In 2017, MENA recorded 375 million unique mobile subscribers and a penetration rate of 64%, found a GSMA report. The rise of e-commerce in MENA is bringing significant opportunity for consumers, businesses, investors and ecosystem players, the report says. 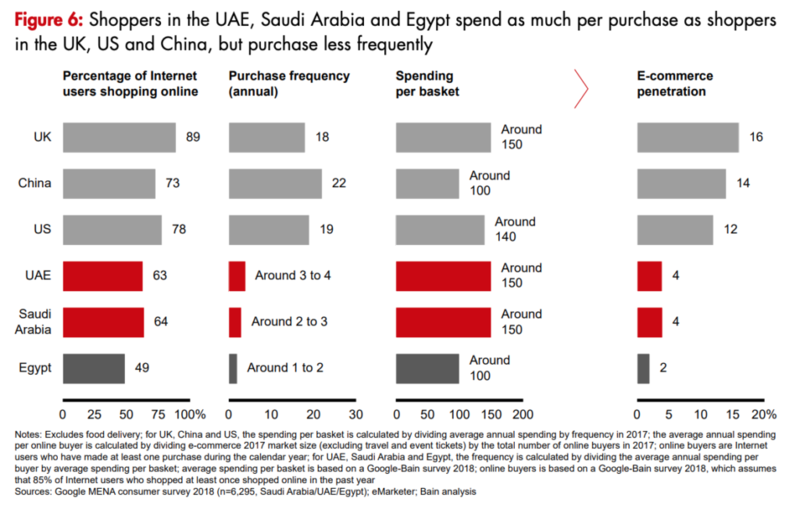 Though MENA consumers tend to purchase less frequently online than in store, they spend as much per purchase as shoppers in the US, US and China. 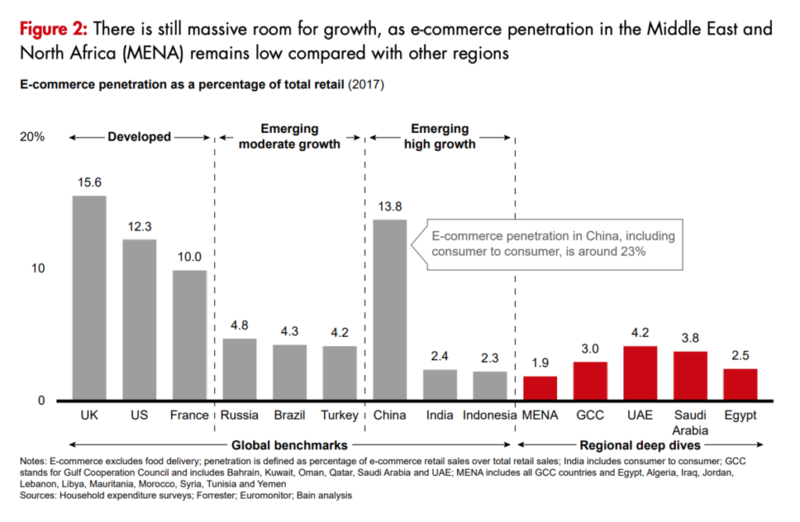 According to the report, limited access to a broad and deep selection of products has been one of the main challenges hindering the development of MENA e-commerce, and this demand-supply imbalance in the region has created an opportunity for cross-border e-commerce with firms including Amazon, eBay and AliExpress actively marketing to MENA consumers. At the same time, regional retailers and e-commerce pure players are taking notice and starting to broaden their product selections, both organically and through partnerships. 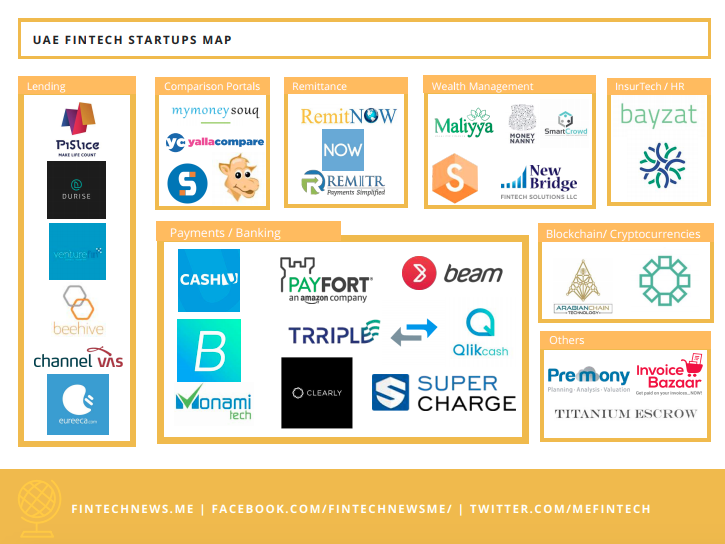 Such partnerships include for instance Souq’s integration with Amazon and collaboration with retail groups eXtra and Alshaya, as well as Noon’s partnership with eBay. Souq, an e-commerce pure player, was the region’s first mover and currently is the market leader in MENA’s e-commerce industry. Wadi in KSA and Jumia in Egypt are also strong players, while Noon is rapidly gaining market share as a strong new entrant. The research forecasts the KSA e-commerce market to grow by 27% annually, reaching around US$10 billion by 2022 with a share of total retail sales at 8%. The expansion of the middle class, the growing role of women in the workforce, improvements in logistics, and access to online products in Tier 2 and Tier 3 cities represent key drivers for the growth of the market. 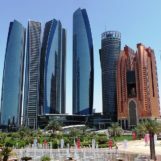 In the UAE, e-commerce is projected to grow by 31% annually, reaching US$8.9 billion by 2022. 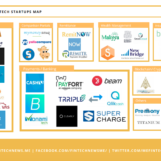 The research predicts broader product selection, the entry of new players, and innovation in business models to play key roles in this growth. In Egypt, e-commerce is expected to grow by 33% annually and reaching US$2.9 billion by 2022. Increased Internet penetration and the expansion of product selection from new local and existing regional players as well as improvements in logistics and payment infrastructure are some of the key growth enablers.